Opportunities to travel by the Kerala State Road Transport Corporation is never to be missed. I simply love those red monsters. 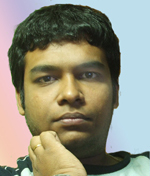 Last week, I had been to Trivandrum on some personal work. I wanted to travel by the City buses there, but had to leave the plan due to extreme time crunch. The next opportunity came in the way of a loooong journey back to Kodungallur by bus... but I had to half-mindedly choose a train - I had never traveled on the route via Kottayam earlier. I had to take the 6525 Bangalore Express from Trivandrum. However, the chance to travel by bus still remained! The next trip occured just a day later. This was longer than the first. After almost a day full of railfanning, I decided to take a bus to Alappuzha from Ernakulam instead of slugging out in a train. Although the train would've taken me to Alappuzha in much less time than the bus, the charm of traveling by bus was something that I did not want to miss! I took out some time to bus fan at the bus station before I chose a bus to reach my destination. I took a Tenkashi bound Fast Passenger bus from Ernakulam. 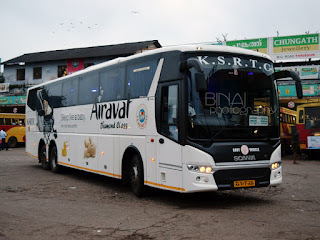 The bus was RRC447 (KL15-6626) of Alappuzha Depot. It was a TATA chassis, and I got a seat right next to the driver. My initial plan was to get down at Alappuzha and change buses to reach my destination. I later discovered that the bus was indeed going via my destination! The bus left EKM (Ernakulam) at 1715. We got stuck up in traffic jams often. The driver was desparate till the time he hit the highway and kept honking all the way. The driving was awesome, and he was real quick! The crowd in the bus too was good. We made a brief halt at Cherthala bus station. The bus had some problem with the horn, and the driver was desperate to get it corrected. He tried his hand at Cherthala, but could not satisfactorily restore it. The traffic on the highway was medium, and he kept speeds in the range of 60-70kmph all the time. The bus finally pulled into Alappuzha depot at 1910. The bus was about 10 minutes early. The driver managed to utilise that time to get the horn attended. The bus pulled out of Alappuzha bus station at 1925, and left me at my destination at around 1945. The crowd after Alappuzha was meagre, and the bus had lots of empty seats. The approximate schedule of the bus is like this: EKM Dep: 1720, ALP Arr: 1920 Dep 1925; Tenkashi Arrival: 2355. In the return direction: Tenkashi departure 0600; ALP arr: 1220 dep: 1420; EKM arr: 1620. The long wait at Alappuzha is since the bus is based there and is taken for maintenance at this time. Direct tickets are not issued from TSI to EKM, and the trip is treated as seperate TSI-ALP and ALP-EKM services. I thought now all the KSRTC buses are fitted Pricol Speed Governors which will not allow the driver to drive above 60kmph. Is that correct? A recent report in "The Hindu" has mentioned that KSRTC buses are now permitted to maintain speeds of up to 70 kmph. I am sure that my bus did exceed 60, since while overtaking a sumo, I did see the speedometer of the sumo showing 60! And, we did that overtake comfortably! I've heard from different sources that KSRTC buses do go up to 90 kmph, and I have experienced speeds above 80kmph in a KSRTC Globus! My first time here! 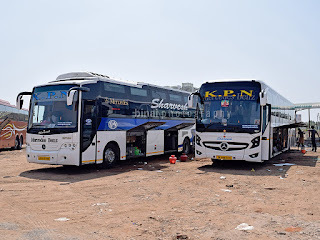 Your post took me back in time to remember my days in Kerala, Kannur and also the times when I had to travel to Kannur from Ooty by the KSRTC bus! The long and ardous journey was always worth the do considering the destination! However, it is time the Govt of Kerala took steps to introduce better and more comfy busses so that passengers can have a smooth ride. 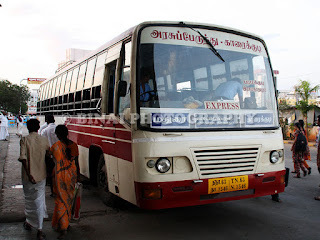 When going to Tenkasi the bus lease ALP at 19.25 and reaches Tenkasi at 23.55 where as on retun it leaves Tenkasi at 06.00 and reach ALP 12.20. Why is it taking more time in reaching ALP.